Earlier this month, NASA announced its plans to conduct its first ever all-women spacewalk with astronauts Christina Koch and Anne McClain. What would have been a giant leap for womankind will have to wait because of issues with women’s spacesuit sizes. Koch and McClain were scheduled to swap out batteries on the outside of the International Space Station this Friday, but NASA canceled it because there was only one medium-size torso outerwear available, and both Koch and McClain wear this size. The mission is currently set to run as planned, with astronaut Nick Hague taking McClain’s place. According to Space.com, fitting spacesuits isn’t as simple as it sounds, given the body grows taller in microgravity. But it does raise questions around where women stand in a typically male-dominated industry. It seems like this problem could have been avoided if more women were considered at the planning stage. In NASA’s history, more than 500 people have ventured out into space but only 11 percent have been women. Last week, McClain took part in her first spacewalk and become the 13th woman to do so in space history. This coming Friday, Koch will become the 14th, while McClain’s next space journey is scheduled for April 8. The cancellation of NASA’s all-women spacewalk is disheartening given the circumstances.But the future looks bright as, Koch and McClain were part of NASA’s 2013 class which was half female. 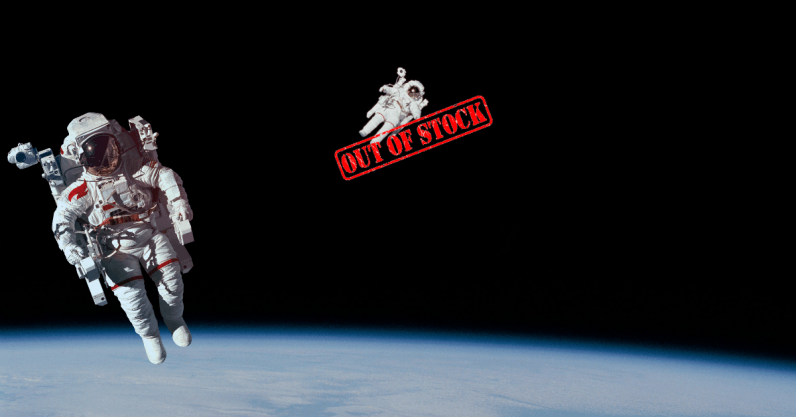 Hopefully, NASA will be able to figure out how to stock spacesuits in all sizes in the future.